If what you want is a no frills pair of earphones that just sound great, the Sennheiser Momentum Free is that pair. There's no fancy noise cancelling, and the design is somewhat hit-and-miss, but they sound superb and offer a rock solid wireless connection thanks to aptX support. 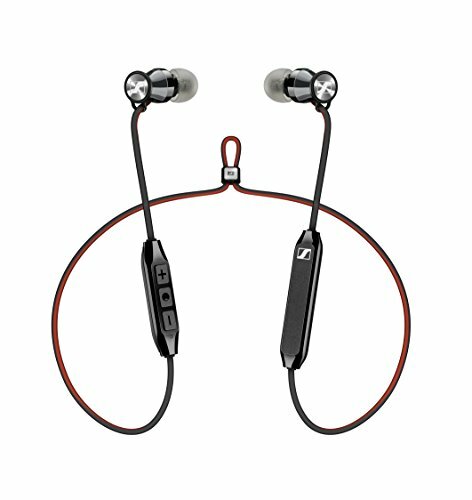 Towards the beginning of 2017, Sennheiser launched an impressive pair of neckband earphones: the Momentum In-Ear Wireless. These super-comfortable in-ears offer superb sound and can last up to 10 hours on a single charge. Clearly, one for inclusion in our list of best in-ear headphones. Fast-forward a few months, into 2018, and there's a new collarless version which promises the same quality, but in a non-rigid design: the Momentum Free. So is it a double strike with the neckband-free version, or does the lighter-weight Free lack that extra something? From the outside, the Sennheiser Momentum Free may not look like all that much, but dig into the specifications and materials used and you start to get a different feel altogether. Unlike their similar-named sibling, the In-ear Momentum Wireless, the Momentum Free has disposed of the plastic horse-shoe shaped neckband, and gone with just a simple cable that wraps around the back of your neck. Like any form factor, this has its plus and minus points. On the "pros" list, the Free is lighter and there's no big neckband, which not all people like. On the "cons" list, however, that lack of a neckband means all the internal components, battery and controls are housed in plastic shells that hang from the ears. And they're big. Sure, they're definitely light enough, and not a struggle to wear, but we did sometimes feel a slight tug on the ear that comes from having this extra weight on a cable. As an addition to this negative, the plastic housing itself feels and looks very plasticky. It's not the look or design you'd expect from a pair of earphones that costs £170. We'd like to see the plastic at least given a soft-touch finish, as you'll find in other premium earphones. The casing of the earbuds is made from a shiny, hard plastic but - and this is where things get good - there's an in-ear tunnel made from a machined stainless steel. This not only gives you a sturdy and high-quality finish, but also means you get great sound (which we'll get to later). Another secret lies within the earbuds too: they're magnetic and snap together for safe-keeping. So when you want a break from listening, you don't have to take them off and stow them away in the included leather-clad case. At least that's the theory. Sadly, in our testing, we found the magnets were too weak and regularly came apart easily, or just took too many goes to get them to snap together. What's more, because the left-side plastic housing holds the battery it's heavier than the right, so we regularly found that left earbud dangling really low, almost falling off our neck completely. Apart from the solid steel earbuds that are impressively small, there's little to laud about the Sennheiser design. The cable and plastic housing is pretty basic, and the magnets are too weak to make them practical. There's definitely plenty to work on here. Still, it is worth mentioning that the leather-clad case that comes with them is a nice addition and leaves plenty of room for other small accessories. What's more - thanks to the dimple on the play/power button - it's fairly easy to blindly choose the right button for playing, pausing and adjusting the volume. Thankfully, the design isn't the main reason to buy. It's all about that sound, and just like the collared Momentum In-Ear, the Momentum Free offer an impressive sound considering the dinky size of the earbuds. Sennheiser's marketing team came up with the description: "powerful bass response, detailed vocal projection and a great sound stage". Hardly catchy, but that comes pretty close to how we'd also describe it. There's plenty of good quality, responsive bass, without the low-end ever overpowering the mix. Bass comes with a definition that often don't get from in-ears, meaning it's not muddy. Likewise, you get the clear vocals and high-end and a good balance of mid-level to fill it all out evenly. Now we're not commenting on this based there being just one sound profile, as we used the Sennheiser's CapTune app for iPhone and Android to fine-tune the sound profile. Using the app, there are a couple of ways to adjust the sound balance. Firstly, there's the usual equaliser which can be adjusted per band. Secondly, there's a "sound check" which takes you through a handful of different presets, asking you to compare one sound to another that's slightly different. Once you've made it through those, at the end you'll supposedly have a sound that suits you. The result, for us, was virtually perfect and needed no further adjustment. Top drawer. Apart from that, the app doesn't have too many important functions. You can see what you're playing (in theory - it didn't work with Spotify for us), you can also see what earphones or audio device you're connected to and change the colour theme. It gets a little more useful if you use only music stored on your device, or you have a Tidal subscription, in which case you can use it as a media player. As far as wireless connectivity goes, the Sennheisers are superb. Thanks to both Bluetooth 4.2 and Qualcomm aptX support, we never experienced a single drop in wireless connection during our testing. What's more, latency was never an issue, so watching videos was all perfectly timed. One area that needs improving is battery life. We can't help but feel this is down to the relatively small battery. The Momentum Free will last a maximum of six hours before needing to be plugged in to recharge. In our testing we were averaging between five and six hours. To put that low battery performance in perspective: the Beats X (a similarly designed pair of earphones) last up to eight hours. So you're getting roughly two thirds of the performance of what many would class as the market leaders in this segment. To look at the Sennheiser Momentum Free have a number of issues. Battery life isn't great. They're rather plasticky in build. There's no fancy noise-cancelling. The snap-together magnet feature isn't strong enough. So why the seemingly generous score? The Momentum Free sound simply superb. The app's "sound check" is brilliant. And connectivity is rock solid over wireless thanks to aptX support. You could find earphones with better battery life, with nicer build quality and even more versatile apps, but you'll struggle to find another pair under £200 that sound anywhere nearly as good. For Apple users it's hard to ignore the sheer convenience of having a W1 chip-equipped pair of headphones. They're stupidly simple to pair and connect automatically to any other Apple device owned by that same user. The audio isn't as refined as the Sennheiser, but the big bass, lightweight design and eight hour battery make them very easy to love. RHA's flagship Bluetooth headphones offer many of the things the Momentum Free doesn't. The industrial design is (mostly) first-class, the sound is brilliant and the battery life lasts for much longer. There is an over-ear hook and a neckband to contend with though, which might not be everyone's cup of tea. With that said, they're only £150 and feel like worth far more than that. Simply put, the Forza Metallo Wireless are among the best in-ears we've used. The design is lightweight and comfortable, they're easy to wear, sound fantastic and can keep on powering your tunes for more than 10 hours at a time. You don't get an app to customise your sound, but you do get great sound straight out of the box.